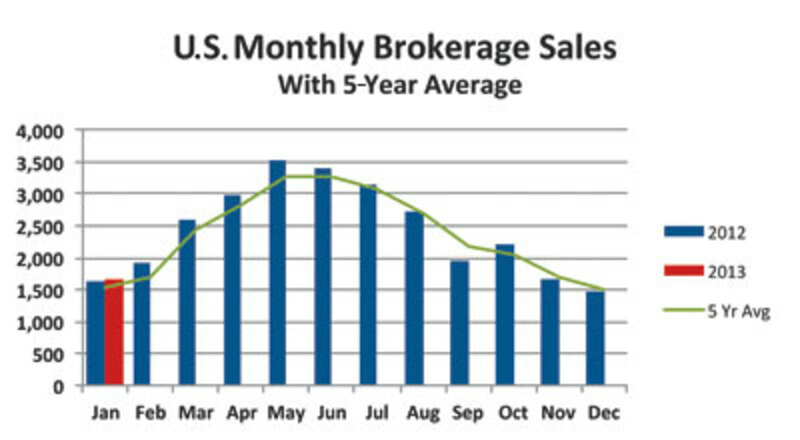 U.S. brokerage sales started the year on an upward trend, slightly above January 2012 sales and well above the January average for the last five years. According to YachtWorld yacht brokers reporting in Soldboats.com, their proprietary database, 1,672 boats changed hands, up 1 percent from 1,655 a year earlier. Total sales were higher than in any January from 2008 through 2012 and well above the average for the period of 1,536 boats. The number of powerboats sold in January, 1,317, was almost dead even with the previous January. By contrast, sailboat sales made a significant gain as 355 boats with masts changed hands, a 19-boat increase. The aggregate price of the boats sold during the month was $236 million, an increase of $42 million, or 22 percent. However, if we exclude the 17 boats sold that were larger than 80 feet, the total price paid was $159 million, within $1 million of the $160 million a year earlier. Even that figure disguises the improvement in sales for the bulk of the market, however, as sales in the 56- to 79-foot range also skewed January’s numbers. Not only did unit sales in that size decline from 55 to 48 boats, but also the total price paid was $10 million less, dropping from $43 million to $33 million. If we exclude sales of all boats larger than 55 feet, we see a slightly different picture of how the volume end of the market performed; sales were generally up and at improving average prices. Although the 26- to 35-foot range remained soft (level sales and a 3 percent decline in value), sales of boats 36 to 45 feet increased 6 percent and sales of boats under 26 feet increased 2 percent. And in both of these improving categories the total price paid increased by a double-digit percentage. Although sales of boats 46 to 55 feet were lower by 12 percent, the total price paid in that category rose by 12 percent. Across the four categories combined, unit sales were up by only 20 boats, yet the total value was up $9 million, or 8 percent, raising the average price paid in the process. Also increasing in January and as a trend was the average time that a boat was listed before it sold. A snapshot of January 2013, compared with January 2012, showed an increase from 265 days to 274. The trend in average time to sale since late 2010 has been gradually downward; as a whole, the average for 2012 was lower than in 2011. But sometime in the second half of 2012 the listing times of boats sold began to increase again. The fourth-quarter average rose noticeably, from 257 days to 269 days, and January continued that trend into 2013. John Burnham is the editorial director of Dominion Marine Media. This article originally appeared in the March 2013 issue.